LiveAdmins provides a sophisticated way of human interaction on your website. 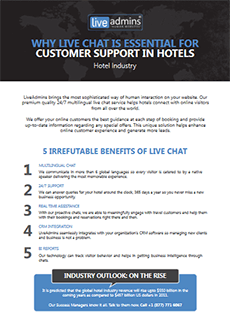 We offer 24/7 multilingual live chat support which helps connect your hotel business with your website from all over the world. We provide guidance to your online customers from booking procedures to up-to-date information regarding special offers. Our solution can help you provide an exceptional customer experience resulting in greater conversion of bookings. Our Live Chat service supports 4 languages – the most compared to any other provider – so you can cater to a wider audience. Our technology integrates with your CRM software so customer and revenue management is never an issue. Our Android and iOS based apps work seamlessly on your smart devices so you never miss an important alert. You’ll be able to track visitors’ location, giving you a better insight into their needs and preferences. We offer chat support in 4 global languages that includes English, French, Arabic, and Spanish to cover a wide range of markets all across the world. Will the customer queries regarding room reservation be answered? Yes, our agents will have sufficient knowledge to efficiently deal with the customers everyday queries and guide them regarding the best hotel packages. Do you provide 24/7 chat services? Absolutely. We ensure that our customers are provided with 24/7 chat support without any interruptions, delays or lags, all year long. Upon request, are chat transcripts provided? You can get complete chat transcripts and data. We keep a record of all chats occurring, so chat transcripts can be forwarded to a list of email addresses. Fill out this form now to see how our solutions can make a difference to your hotel business.